Though this article has been included on this website for a long time it now forms part of a series of articles featuring animals in art. As a person who loves and cares about animals and an on-line activist for the cause of animal rights I often paint animals or include animals in some way in my art work. So I thought it might be interesting to showcase the work of other artists from the past and present, both the famous and not so famous who have chosen animals as subjects or have prominently included animals in their art. These articles will also include an How To section where you can find links to art instruction information concerning the featured animal. Also an How To Help section with information concerning how you can help whichever animals is the subject of the article. 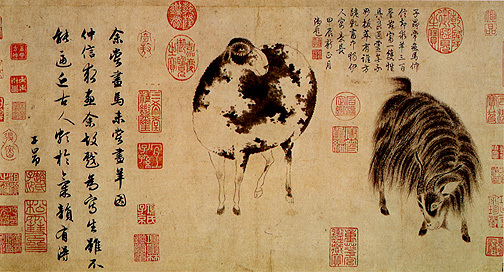 This section highlights sheep as they feature in works of art down through the ages to the present day. 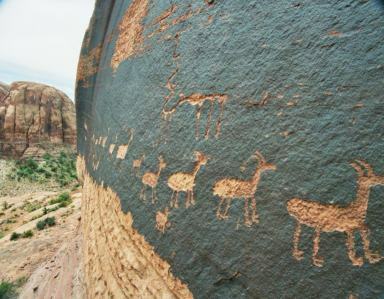 The above petroglyph (not to be confused with pictograph) shows a caravan of bighorn sheep near Moab, Utah, USA. Petroglyphs are found throughout the world mostly rendered by prehistoric people, they are made by craving and incising, rather like engraving. Although the reasons why they were created is not known it has been suggested that petroglyphs may have religious or cultural significance. Petroglyphs may also represent some kind of symbolic communication or ritualistic language. It is also thought that they may have been made by shamans in an altered state of consciousness, induced perhaps by the use of natural hallucinogens. In western cultures during the middle ages religion was the subject of most art. The art of Stained glass painting, which may be seen in churches and cathedrals from medieval times to the present day, often features sheep. Sheep are symbolic in the Christian religion, sheep in religion and mythology and this symbolism is depicted in many amazing stained glass windows. Here is a selection from the UK. This example in in St John's chapel, Ludlow parish church and dates from the 15th century. Het Lam Gods the lamb of God . 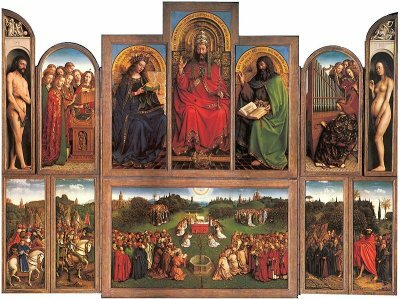 Completed in 1432 the Ghent Altarpiece, is an early polyptech panel painting from the Netherlands painted by Jan van Eyck. 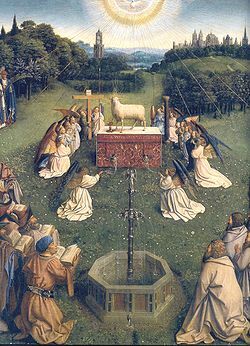 The section above shows the adoration of the lamb of God, which refers to Jesus' mission as a sacrificial lamb who by his sacrifice atones for the sins of mankind. Below is a fine example of contemporary art work and again the subject is religious symbolism. 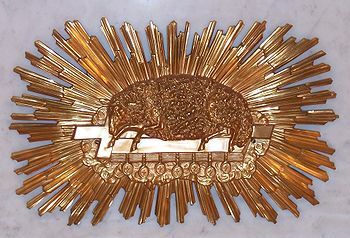 This is an unusual Agnus Dei from the alter-front in the Cathedral of the Assumption in Louisville, Kentucky. Agnus Dei is Latin for the lamb of God and like the polyptech above by Jan van Eyck it is analogous to Jesus' mission as that of a sacrificial lamb. A bestiary in short is a catalogue of beasts, sometimes plants and minerals were included also. Such volumes were popular in the middle ages. 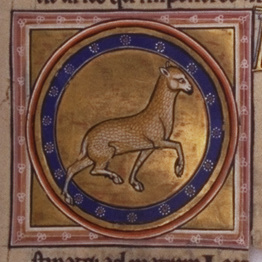 A bestiary includes a drawing or highly decorative illumination of each animal along with a short description of its attributes and behaviours. Included are all sorts of animals both real and imaginary, including sheep. 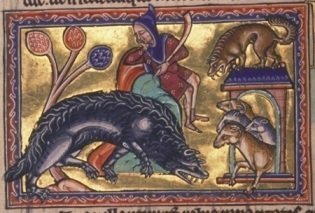 Bestiaries deal with the natural world, although the theme of religion still presents as the account of the immergence of life at this period and is still of course biblical. 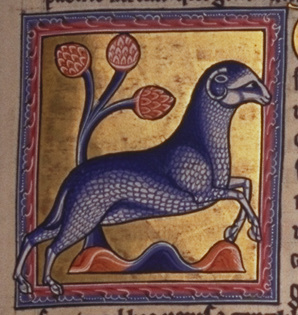 Considered one of the best examples of illuminated manuscripts the Aberdeen bestiary was written and illuminated in approximately 1200. The book is lavishly illustrated and contains the biblical account of the creation story and gives short but non scientific descriptions, some of which are amazingly accurate while others are fanciful, along with a moral lesson. Concerning lambs the writer correctly observes that sheep are good mothers and a lamb recognises his or her mother's bleat from amongst thousands. Below is the translated description of the ram and lamb which accompanies the graphics above. "The wether gets its name, vervex, either from its strength, vires, because it is stronger than other sheep, or because it is a man, vir, that is, male, or because it has worms, vermes, in its head; irritated by the itching which these cause, wethers strike each other, butting their heads together in combat with great force. It is also called a ram, aries, from the Greek, Ares, that is, the god of war; in Latin, Mars; that is why we call the males in a flock mares. Or because, once upon a time, this animal was offered as a sacrifice by pagans on their altars: thus, aries, because it is laid upon an altar, ara. 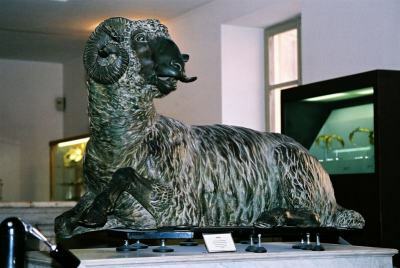 From which we get: 'the ram is sacrificed at the altar' (see Exodus, 29:18)". "The lamb is called agnus possibly from the Greek word agnos, pious. Some think that it gets the Latin form of its name because, more than any other animal, it recognises, agnoscere, its mother, so much so that, even if it strays in the midst of a large flock, it recognises its mother's voice by her bleat and hurries to her. It seeks out also the sources of mother's milk which are familiar to it. The mother recognises her lamb alone among many thousands of others. Lambs in large numbers make the same baa-ing noise and look the same, yet she picks out her offspring among the others and by her great show of tenderness identifies it as hers alone." 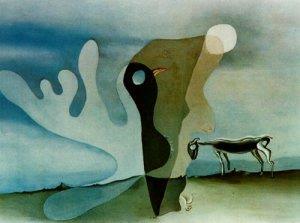 "I have painted horses before, but have never painted sheep [or goats]. So when Zhongxin requested a painting, I playfully drew these for him from life. Though I cannot get close to the ancient masters, I have managed somewhat to capture their essential spirit." The subject of this Pre-Raphaelite painting by William Holman Hunt was inspired by Shakespeare's King Lear, in the play Edgar sings a song about a shepherd neglecting his flock. When the painting was first displayed in the Royal Academy it was accompanied by this quotation from King Lear Sleepeth or waketh thou, jolly shepherd? At first glance the scene appears idyllic, however, it is full of symbolism. 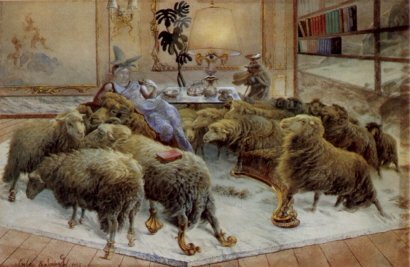 There are several suggestions as to the nature of the symbolism in this painting, one of which is that Hunt uses the hireling shepherd to demonstrate the importance of a good work ethic as opposed to the potential detrimental effects of idleness; the shepherd's neglect has resulted in the poor health of the sheep. If you look carefully in the back ground you will see a sheep on her back, legs flailing in the air, other sheep have escaped into the corn filed and will be ill as a consequence of what farmers call being "blown", the girl is feeding the lamb green apples which will make him sick. Often though Hunt's paintings had religious symbolism. 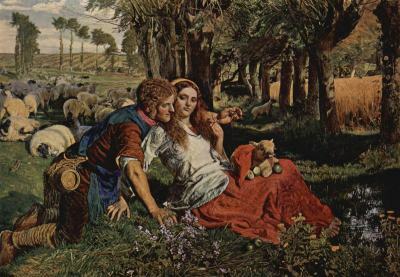 Hunt was a Pre-Raphaelite painter, symbolism was important to the Pre-Raphaelites, and in a letter to Manchester City Art Gallery he indicated that the couple symbolised the pointless theological divisions which occupied the attentions of many clergymen, and while so distracted their "flocks" went astray; shepherds and sheep have biblical symbolism as discussed in sheep in religion and mythology. A congregation is compared to a flock and Jesus to a shepherd. The charming pastoral scene above intricately painted and rendered in oils on canvas was painted by William Holman Hunt in 1852. 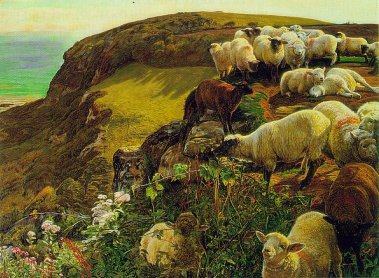 After the success of The Hireling Shepherd William Holman Hunt was asked by Charles T. Maud to paint another picture continuing the theme of the wandering sheep, the painting shows the staying of the neglected flock along the cliffs. For the back ground of the work Hunt used the cliffs of Fairlight, east of Hastings. 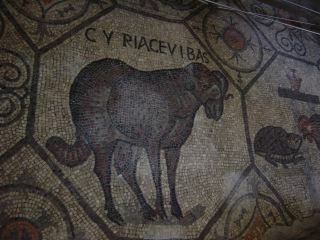 The above is a Roman mosaic showing a ram found in Aquileia in Friuli Venezia Giulia, Italy. Both this and the mosaic above are fine examples of the ancient Roman art of mosaic, the art of creating images with small pieces of coloured stone or glass which are formed into tiny tiles known as tesserare which are used to create pictures or patterns. 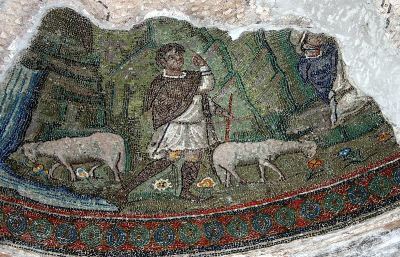 Mosaics where used to decorate the floors, walls and even ceilings of Roman villas or other places of importance.The art of mosaic presents in other cultures through the ages to the present day. A modern example of mosaic is the Museum of Natural History station of the New York Subway. 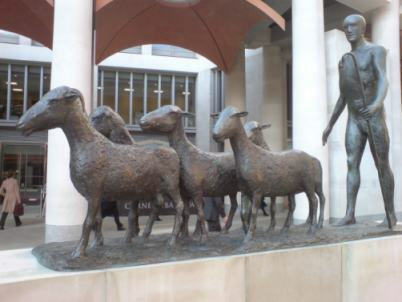 Shepherd and Sheep sculpture by Dame Elisabeth Frink, called Paternoster, it is situated in Paternoster Square, London, which was in times past a live stock market. Light relief. You might find this link amusing as well as very creative. Be sure to read the text which accompanies the photographs. "How to draw Sheep & Lambs. Sheep & Lamb Drawing Lessons and step by step drawing tutorials. Learn how to draw and sketch Sheep and create great cartoons, illustrations and drawings with these free drawing lessons." Did you know that sheep can learn their own name and be taught tricks just like dogs? Did you also know that right now, these gentle animals need your help? Sadly, in the meat and wool industries, sheep's interests come a sorry second to profits. Denied the protection of the cruelty laws that protect other animals, these intelligent, feeling animals can have parts of their bodies cut off without pain relief, and be cruelly confined. 5) Photograph File:Aquileia, Basilica. Montone Foto Giovanni Dall'Orto.jpg Giovanni Dall'Orto. Important: Please note the information on this webpage is included for interest only, it is not suitable for serious study as precise accuracy cannot be guaranteed. Please keep in mind that information included on this website has been researched to the best of my ability and any misinformation is quite by accident but is of course possible.